Dr. Jose P. Laurel of Batangas (left) and President Elpidio Quirino. Both photos in the public domain. Readers will recall from high school History books that the Ilocano Elpidio Quirino was elected as the 6th President of the Philippines1 and 2nd after Manuel Roxas of the so-called Third Philippine Republic. Having assumed the presidency due to the untimely demise of Manuel Roxas in 1948, he would defeat Batangas’ Dr. Jose P. Laurel the following year in what some accounts called “the dirtiest elections” in Philippine History up to that point. From a declassified Central Intelligence Agency (CIA) document2 dated August 1950, we are able to gain insights about how the American intelligence community viewed Quirino’s presidency. Likewise, we get some insights about how the same community regarded Laurel’s role in Philippine politics. It may interest the reader to know that this was a time when the Philippines still modeled its party system after the United States’, which up to the present has a bi-party system with the two major groups being the Republicans (conservatives) and Democrats (liberals). In the Philippines, the two parties were the Nacionalistas (conservative) and the Liberals. The CIA’s use of the word “collaborator” was in reference to Laurel’s having been appointed President of the 2nd Philippine Republic, for all intents and purposes a puppet government of the Japanese Imperial Army in World War II. 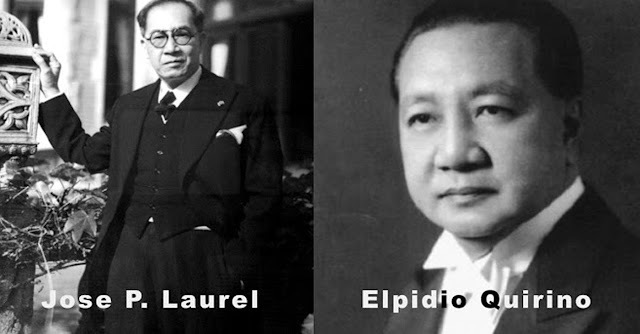 Further discussion on whether Laurel was a collaborator or not is available in this article: Was Dr. Jose P. Laurel, Batangueño President of the 2nd Philippine Republic, a Traitor? Laurel would, in fact, be overwhelmingly elected to the Senate in 1951. But Quirino was, in fact, not done just yet. Despite failing health, he ran for a second term in 1953. The writing was, however, on the wall as early as 1951 when no member of the Liberal Party was elected to the Senate. It was likely no surprise one Ramon Magsaysay, erstwhile Secretary of National Defense, became the Philippines 7th President. 2 “Prospects for Stability in the Philippines,” published 10 August 1950 by the United States Central Intelligence Agency, online at the United States National Archives. 3 This was Vice-President “Fernando Lopez” of Iloilo. Wikipedia.